Five Paragraph Essay? Piss on That! Ah, yes. 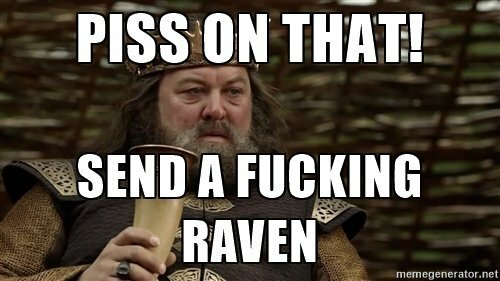 The always classy Robert Baratheon, ladies and gentleman! Though slightly crass, this drunken fool of a fictional king embodies my view of the five paragraph essay. For someone who likes a set of, erm, set rules, I sure don’t follow them very well. My memory is quite poor when I think about the specifics of my time in middle school and high school. I can say with confidence that I most certainly wrote essays in the five paragraph style during middle school. Towards the end of my high school career, I found myself distancing myself from that format more and more. I can’t remember if I received this advice from a teacher, or if I discovered this idea myself, but I began writing as much as I needed to write to get my point across. Gone were the days of frustration over the inability to create that last paragraph. Gone were the days of the mass-produced cut-and-file jobs I used to do. I began to write bespoke, meaningful pieces with their own flavor. I felt free from the shackles of the five paragraph style. For fear of sounding as if I am out to bash the five paragraph essay into oblivion, let me state right now that I do not hate it. I do think it is a great tool to teach beginning writers to focus their writing. I think it serves a superior purpose as guidelines than actual rules. If I were teaching students the basics of writing an essay, I would say that the five paragraph style is more of a jumping off point than an actual requirement. Just as the Marines are not looking for robots, I am not looking for facsimiles disguised as serious essays. I feel that constraining students to the five paragraph style harms their ability as writers. They will be more focused on how to fulfill the requirements to a T. Instead of giving me an engaged, passionate piece of literature, I get a drab and dreary econobox when what I really want is a fine Rolls-Royce. I do not want a “one size fits all” paper. I want a paper that is not only tailored to my needs, but also to the author’s. The mark of a great author is their willingness to break the rules. To transcend the conventions expected of them is no different than what the Dada artists of post-World War I Europe did. To be remembered means to break the mold and bring something new to the table. Trying to smother that inhibition with a nanny blanket will stifle any aspiring author and snuff out a potential Hemingway or Cummings. So many great lines here Alec: “I think it serves a superior purpose as guidelines than actual rules.” And “Trying to smother that inhibition with a nanny blanket will stifle any aspiring author and snuff out a potential Hemingway or Cummings.” I enjoyed reading this! Nice Meme Alec. I’m having the same problem recalling what kinds of papers I wrote in middle school and high school. I know I’ve encountered the five paragraph essay, but I also know that I haven’t encountered it so many times that I’m experiencing hatred for it. I remember writing a “report” about flamingos and another about South Korea in middle school lol, but that’s about it. High school was all about essays in lit class, but I don’t really remember what methods were used regularly. When I transferred to a charter school half way through, they really didn’t care how I wrote my papers, as long as they made sense. Anyway, I think something like the five paragraph essay is good for beginning writers too, but not something EXACTLY like it. Learning how to write for school can be really stressful and it probably shouldn’t be, you know? I think a replacement “guideline” should be in order, one that allows for a little more room to move.